You are here: Getting Started > How to Sign up and log in? 1. 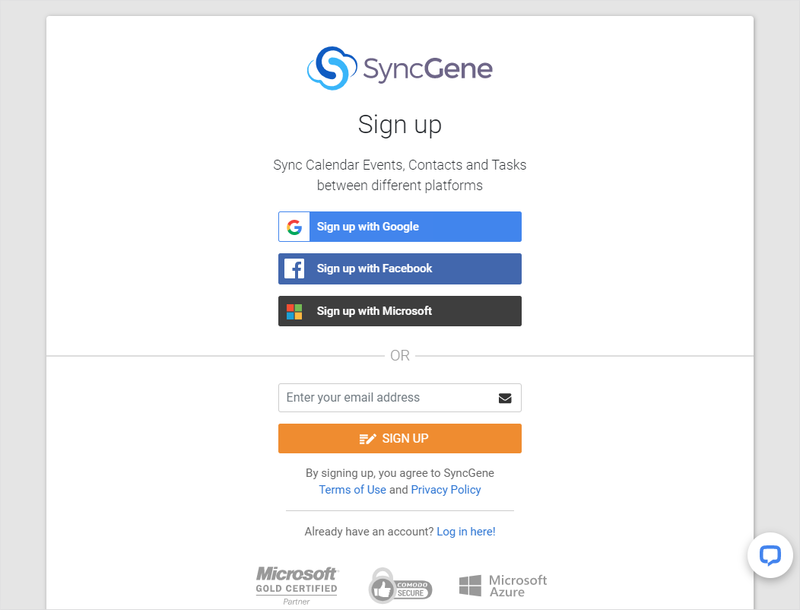 Sign up for SyncGene service by using your Facebook, Google, Microsoft accounts or email address. 2. In case, you have signed up for service using your email address, please confirm your email via link sent to your inbox. 3. After the registration is successfully completed, you can use Facebook, Google, Microsoft log in, or enter your email and password into required fields and complete login process by clicking “Log In” button. 4 Start the synchronization. More about how to "Add Accounts"
Once it’s set up, it’s done automatically in the background, so there is no need to come back to it*. SyncGene automatically syncs all the latest updates in the data. *Premium subscription only. You can try automatic synchronization with your Free subscription for 7 days. Please note: You can easily restore data into original point, after the synchronization is completed. Before synchronization your data is automatically backed up and stored in your Google Drive account. 4.1 Share a Calendar. More about how to "Add Accounts". When calendar is shared, all items in the calendar will be shared automatically. 4.2. Accept a Shared Calendar. If you received a shared calendar invitation, you can read more here.